Many organizations include users who are distributed across WAN links and users who are not always connected to the network. Microsoft SharePoint 2010 Products accommodate various network scenarios and work environments. This article describes the client solutions that can be used across slow network connections or when users are offline. The following tables compare the solutions by indicating the circumstances in which a solution works best and the scope of access a solution provides for SharePoint sites. The rest of this article describes the solutions in more detail. Mobile views are not only for mobile devices. In low bandwidth or high-latency environments — such as latencies of 300 milliseconds or more — mobile views can provide acceptable performance when they are used to navigate a site hierarchy, complete simple forms, and view textual data. To display a mobile view in a non-mobile browser, append ?mobile=1 to the URL of any SharePoint site. By default, mobile views are enabled for most lists or libraries that are created by using default templates. By default, mobile views are not enabled for custom lists, custom libraries, or for lists or libraries that were created in previous versions of the product that have been upgraded to Microsoft SharePoint Foundation 2010. Mobile views are not available for Datasheet and Gantt view types. To configure mobile views for lists and libraries, see Configure mobile views (SharePoint Server 2010). Microsoft Office Web Apps are online companions to Microsoft Word, Microsoft Excel, Microsoft PowerPoint, and Microsoft OneNote, which enable people to access files and do light editing in a browser without downloading and uploading files over low-bandwidth or high-latency connections. When Office Web Apps are enabled for a site collection, you can choose to view and edit files in a browser, as shown in the following illustration. In most cases, opening files in a browser results in a faster time-to-first-page than opening files in one of the Microsoft Office 2010 client applications. When users use Word Web App on browsers that have the Silverlight plug-in installed, they can experience faster page loading, improved text fidelity at full zoom, Microsoft ClearType tuner settings support, and improved accuracy in location of search string instances when they use the Find on this Page command. When users use PowerPoint Web App on browsers that have the Silverlight plug-in installed, they can experience faster page loading, animations will appear smoother, and presentation slides will scale with the browser window size. There are no additional benefits in Excel Web App and OneNote Web App when Silverlight is installed on the client browser. For more information about Silverlight, see Microsoft Silverlight (http://go.microsoft.com/fwlink/p/?LinkId=206068). For more information about Office Web Apps, see Microsoft Web Apps Deployment (http://go.microsoft.com/fwlink/p/?LinkId=206018). Office 2010 combined with SharePoint 2010 Products improves the experience of users who are using and managing files over slow network connections. Files that are open from SharePoint 2010 sites are downloaded by using asynchronous file transfer and cached locally. As a result, files open more quickly and users can start using the file before the download is complete. Additionally, only changes to files — not whole files — are transmitted between SharePoint 2010 Products and client computers. These capabilities are made possible by the new File Synchronization via SOAP over HTTP (MS-FSSHTTP) protocol. The Document Cache settings and features can be accessed and managed through the Upload Center, a new feature of Office 2010 that is automatically installed. Users can access the Upload Center by either clicking the Upload Center icon in the notification area or by opening it from the Start menu. The Upload Center lists all files that have been cached. Cached versions of files can be taken offline and managed through the Upload Center. Users can monitor the status of files that are in the process of being uploaded. As shown in the following illustration, users can also manage cache settings to determine how long cached files are retained and to delete all cached files, if necessary. Users do not have to access and manage the Upload Center to take advantage of the caching abilities of Office 2010. The functionality of Office 2010 takes place in the background, even without user intervention. When users are working with earlier versions of Office, such as Office 2007, BranchCache can be used to reduce bandwidth utilization and download times for frequently accessed content. BranchCache, when it is enabled on the server and client computers, greatly reduces the time to open files that have been cached. However, BranchCache does not reduce the amount of network bandwidth that is used when a file is saved back to a SharePoint site. BranchCache cannot be used in combination with Document Cache and the MS-FSSHTTP protocol. If both BranchCache and Document Cache are implemented, communication takes place by using the MS-FSSHTTP protocol. The use of SharePoint Server 2010 in combination with Office 2010 results in significantly better WAN performance overall. For more information about how to use BrancheCache, see BranchCache in Windows 7 and Windows Server 2008 R2 Overview (http://go.microsoft.com/fwlink/p/?LinkId=206069). Users can synchronize a SharePoint library, contact list, task list, project task list, and a certain type of SharePoint external list with Outlook 2010. Because many users of SharePoint 2010 Products also use Outlook 2010 to collaborate and coordinate activities and projects, the ability to synchronize these libraries and lists can help users become more efficient, especially when they are working offline or when access to SharePoint sites is not convenient. Just as in other Office 2010 applications, SharePoint files that are synchronized with Outlook 2010 are downloaded, uploaded, and cached by using the MS-FSSHTTP protocol. The result is better performance over slow network connections than the performance in previous versions. To synchronize a SharePoint library with Outlook 2010, on the Library tab, in the Connect & Export group, click Connect to Outlook, as shown in the following illustration. When users are working offline, changes to files are saved locally. When they are online again, users can select to either upload changes to the SharePoint library when the client application first synchronizes or to keep the changed files locally. Outlook 2010 does not provide peer-to-peer synchronization of content in SharePoint sites. Outlook 2010 provides a personal offline experience for individual team members. By default, synchronized files are not checked out automatically. A user cannot check out a file within Outlook 2010. The recommended practice is to check out files within SharePoint 2010 Products before synchronizing and editing the content in Outlook 2010. For more information, see Synchronize SharePoint 2010 content with Outlook 2010 (http://go.microsoft.com/fwlink/p/?LinkId=206097). Microsoft SharePoint Workspace 2010, formerly Microsoft Office Groove, is a client application for Microsoft SharePoint Server 2010 and Microsoft SharePoint Foundation 2010 that supports online and offline collaboration. SharePoint Workspace 2010 builds on the previous version and adds powerful new tools that let users access and share content that is stored on SharePoint sites, even when users are not connected to corporate networks. SharePoint Workspace 2010 is included with Microsoft Office Professional Plus 2010 and provides the most robust offline experience for SharePoint sites, allowing users to take entire SharePoint sites offline. The following illustration demonstrates how to synchronize a site with SharePoint Workspace 2010. For more information, see What's new in SharePoint Workspace 2010 (http://go.microsoft.com/fwlink/p/?LinkId=206098). Windows Phone 7 includes Microsoft Office Mobile, which lets users work with files from their telephones. Microsoft SharePoint Workspace Mobile is part of Office Mobile and already on the telephone in the Office Hub, as shown in the following illustration. View content hosted on a SharePoint 2010 site. Open and edit Word, Excel, PowerPoint, and OneNote files that are hosted on a SharePoint 2010 site. Browse SharePoint 2010 sites, lists, and document libraries. Increase the security of remote access to corporate resources through Microsoft Forefront Unified Access Gateway (UAG), if their company uses it. 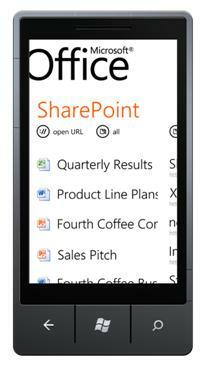 Users can also use Microsoft SharePoint Workspace Mobile to take SharePoint 2010 files offline on the telephone. Users can open and edit the files, and then save them back to the SharePoint site when the users are back online. For more information, see Office Mobile 2010 for Windows Phone 7 (http://go.microsoft.com/fwlink/p/?LinkId=206099). SharePoint Workspace 2010 can also be used together with Microsoft Groove Server to provide peer collaboration that does not require all team members to be connected to SharePoint 2010 Products. Collaboration can be extended outside a private network to trusted partners and field sites. With this configuration, at least one team member must have access to the SharePoint sites. Other team members must have access to either the computer of another team member who has access to the SharePoint sites, or access directly to the SharePoint sites. The following illustration provides an example of this architecture. For more information about SharePoint Workspace and Groove Server, see Plan for SharePoint Workspace 2010.